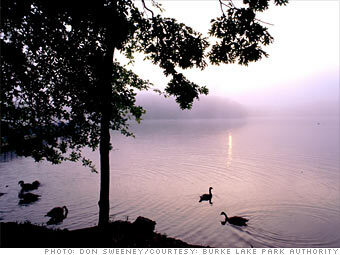 Set around Burke Lake, this family-oriented community has a character different from most of Fairfax County's newer towns. For decades, families have been riding around Burke Lake Park in a miniature steam engine, stopping for hand-dipped cones at the ice cream parlor, and hiking or biking along the trails and fishing in Burke Lake. But the city is also near a large cluster of technology firms and the Washington D.C. area.